Headliner is a free online social media video creator with full HD export without watermark. It allows you to easily create stunning videos for various social networks like Instagram, Facebook, Twitter, etc. The main USP of this video creator is its simplicity and instinctive interface. 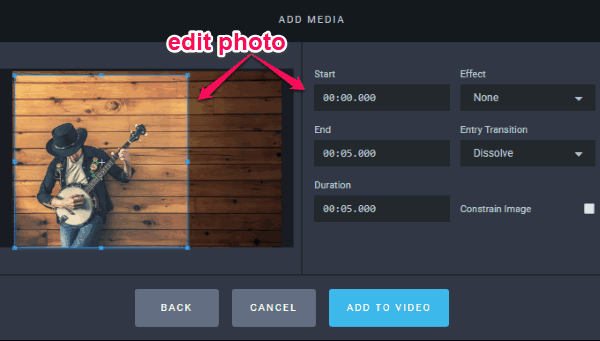 You can simply open the editor and create a video by adding your own media files (like audio, videos, and photos), custom text captions, etc. It lets you create as many social media videos as you want for free without any limit on the video length. 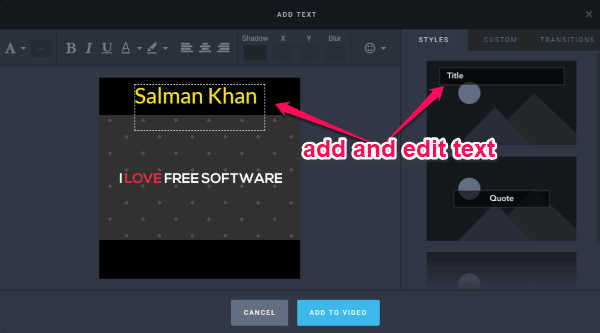 To make your social media video look amazing, it lets you edit the media files, typography, etc. There are many other social media video makers available, which allow you to create and download video with a decent quality. But, if you want to make some HD videos and export them for free without imprinting any watermark, then “Headliner” is the best choice for you. To get started, the first thing you gotta do is browse the homepage of Headliner and register for a new account. Once you do that, you can either choose some predefined video templates or start from scratch by selecting the “Blank Project” option. 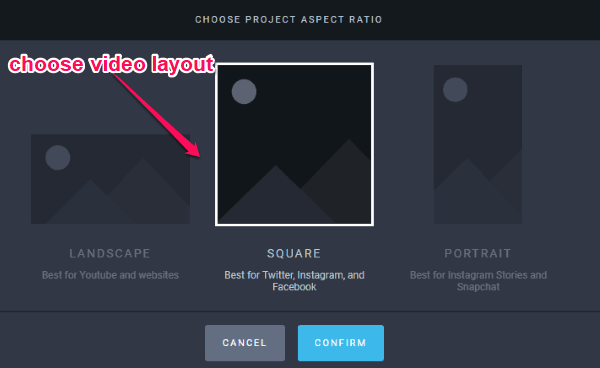 After that, it will ask you to choose an aspect ratio/video layout ideal for different social networks. You can either select Landscape (for YouTube and websites), Square (for Twitter, Instagram, and Facebook), or Portrait (for Instagram Stories and Snapchat). As soon as you select a layout, it will open up the video editor. Now, you can see the timeline at the bottom with separate tracks for adding audio, media files (photos & videos), and text captions. At the top, there will be a section where you can view the video preview and editing changes. Now, to create a social media video, simply go ahead and start adding the media files and text. To add photos and videos, the first thing you need to do is click on the “+” button associated with the “Media” track on the timeline. As soon as you do that, a popup window will appear where you can upload the photos and videos which you want to include in the video. There is no limit on the number of files which you can add to the video, but the size of a single file is limited to 200 MB. 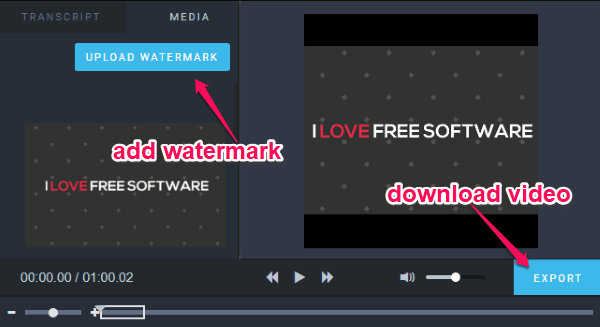 It allows you to easily upload media files from your PC (supported formats are MP4, MOV, PNG, JPG, and SVG) or by entering a video or image URL. Apart from that, you can also browse and select photos from various online platforms including Google, Pixabay, Microsoft, and Stock Image/Video. For each file you select, it will allow you to edit different aspects. For example, when you select an image, it will let you crop the image, choose start and end time in the video, set duration, add different effects (like Zoom, Pan, etc. ), and also add an entry transition. There are various animated transitions available like Wipe, Dissolve, Slide, etc. which you can add to the photo. 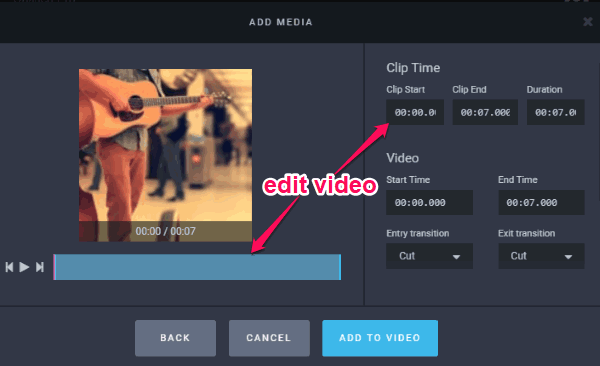 Now, let’s say you have selected a video, then you will find the option to trim the video length, set the clip start & end time, duration, video start & end time, add an entry and exit transition (like Cut, Dissolve, etc.). You can also manually set the video audio level, main audio level, and even add audio fade-in and fade-out. Once you’re done selecting and editing a photo or video, simply click on the “Add to Video” button to add it to the timeline. 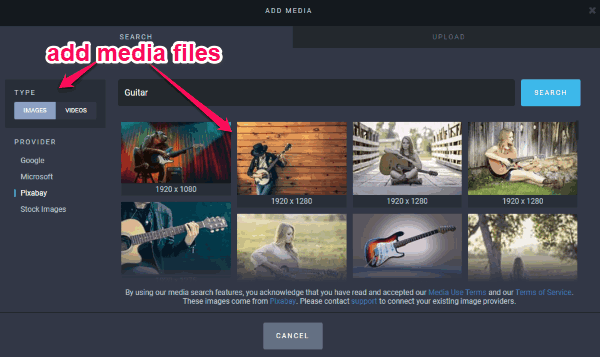 This way you can add as many media files as you want for creating the social media video. Now, to add audio to the video, you would need to click on the “+” button associated with the “Audio” track. After you do that, you will see the option to upload audio from your PC. 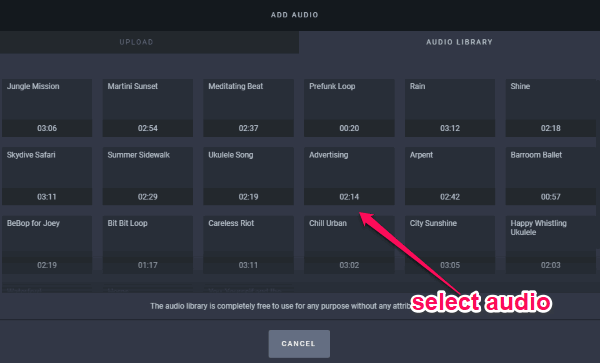 Apart from that, it comes with a predefined audio library from which you can add various attribution-free audio to your video. 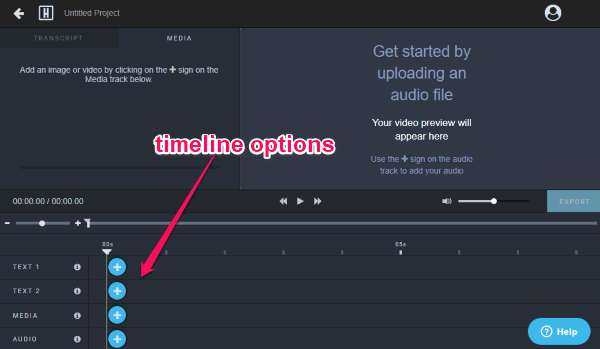 After you select an audio file, it will allow you to edit it before adding to the timeline. 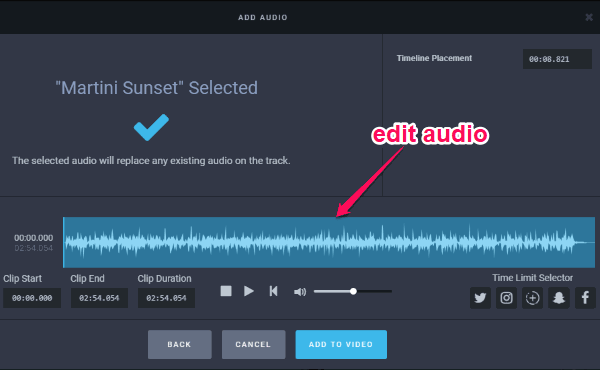 You can manually trim the audio length, select clip start & end time, clip duration, and set timeline placement time. Another interesting feature which you will find is “Time Limit Selecter”. It allows you to directly trim the audio to the length which is ideal for Twitter, Instagram, Instagram Stories, Snapchat, and Facebook. When you’re done editing the audio, hit the “Add to Video” button to add it to the timeline. You can add multiple audio files if you want with no limit on the duration. Now, the last thing which you can add to the social media video is text. For text, there are two different tracks available in the timeline named, Text 1 and Text 2. You can click the “+” button associated with either track to add text to the video. It will open a popup window where you can type text, change the formatting, add shadow, blur, include emojis, etc. On the right, you will see the option to choose the text style either as the title, quote, or caption. In addition to that, you can customize various aspects of the text like start & end time, add background, set line spacing, padding, and position of the text. Another interesting thing which you can do is add different transitions (in/out) to the text. So, this way you can add text on both the tracks and position them anywhere you want on the video. When you’re done with adding media files, audio, and text to the timeline, you can rearrange them by dragging if you want. At the top, you will also see an option to add a custom image watermark to the video if you want. This can come in handy, if you want to show your business logo, add branding, etc. You can now preview the social media video and then proceed to export it as a full HD video file. For that, simply click on the “Export” button and then it will open a popup window. Now, you can go ahead and manually choose the frame rate, video quality, and video size. It lets you select 3 different video sizes including Standard, HD 720p, and HD 1080p. Apart from that, you will also see the option to add a custom intro and outro clip to the main social media video from your PC. 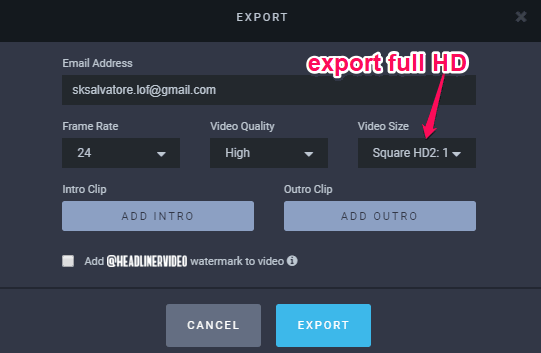 Once you’re all set, hit the “Export” button to generate and save the video without any watermark. You can also upload the video directly to Google Drive and Dropbox or share with others using the video URL. Headliner is no doubt an amazing social media video creator which helps you create some astonishing videos for social media in no time. The intuitiveness of this online video editor is what makes it more useful. You can simply combine your media files with text and you will have a great video ready for sharing on social media. What I like about this social media video maker is that it lets you create videos ideal for different social media layouts. So, try “Headliner” from here for free.